Try out this free, ten-question practice exam to see the SWTP program in action. We hope you'll purchase full, four-hour practice exams once you're done. 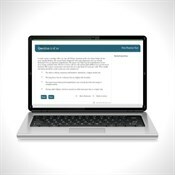 There's no better way to prepare for the licensing board exam than real-time, online practice. SWTP's practice exams--always affordable--are currently offered at a generous discount (see the sidebar or mobile page bottom for details).